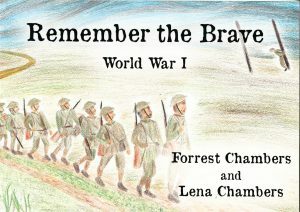 Palmerston North parishioners Forrest Chambers and his daughter have produced a children’s book entitled Remember the Brave, World War 1. They launched it on 2 September in Palmerston North. The book, written by Forrest and illustrated by Lena, is dedicated ‘to those who have resisted war, who resist war today and to those who will resist it in the future’. Forrest and Lena are members of the Catholic Worker movement and live in Palmerston North. Thom Conroy, senior lecturer in creative writing at Massey University, introduced Forrest and Lena to around 40 people at the launch. He described the book as well-researched and beautifully illustrated with an urgent and universal message today, ‘when we need to stand up for peace’. Thom said it is the only children’s book about pacifists in war time that he is aware of. We heard about two New Zealand pacifists, Archibald Baxter (father of James K Baxter) and Mark Briggs, who lived and worked in Palmerston North after WWI. Forrest discussed the psychological impacts of post-traumatic stress disorders and explained ‘moral injury’ as damage to a soldier’s soul when they reflect on their wartime actions. Often experienced as isolation, withdrawal, depression and suicidal thoughts, and too often leading to suicide, the soldiers can’t be protected from the damage done. This led to a wider discussion on the moral-injury impacts of child abuse by clergy and others. Forrest said the way forward is to acknowledge the dreadful experience of war or abuse, warts and all. Denial only extends the pain. It was a thought-provoking launch and I can recommend it. Published by Createbooks, the book retails for around $20 and can be purchased online from a variety of outlets. 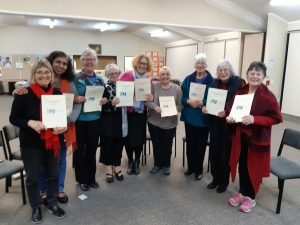 Women from the Palmerston North Interfaith Group gathered at the Catholic Diocesan Centre on 22 August to celebrate the publication of their ‘book of talks’ a year on from their 2017 interfaith seminar. At last year’s seminar on 24 August, titled Interfaith Women Resist the Climate of Hatred and Fear, women from seven faith traditions discussed ‘how the climate of hatred and fear in public discourse legitimates destructive attitudes and violent behaviours towards people considered other’. Women and children are the most vulnerable to messages of discrimination and prejudice. Since 2011, the group has organised programmes of interfaith dialogues about theological exchange, religious experience, action and life. Georgia Collins and Michelle Teahan at the Diocesan Centre helped with binding the booklet, part 2 of which is the history of the Palmerston North Interfaith Group. The interfaith women plan to volunteer to help refugee women learn English at the Manawatu Multicultural Centre, and to support minority women who have experienced discrimination at the Women’s Centre. They will also participate in a peace gathering on 27 October at The Square in Palmerston North to protest about the ‘weapons expo’ at the Arena, 30 October–1 November. The expo is a meeting of 500 global armaments manufacturers and dealers. The women’s presentations and the history of the Palmerston North Interfaith Group can be downloaded from the diocesan website: pndiocese.org.nz/interfaith.